Cardiff Beauty Blogger - Sindyydoll ♥ Makeup - Welsh beauty blogger - British Beauty Blogger: Giorgio Armani Blogger Event! I was invited to come along to the Blogger event held in Cardiff Debenhams to see how to get an Armani Glow, and have a look and test some of Armani's products out at their pop up (Soon to be static) counter. 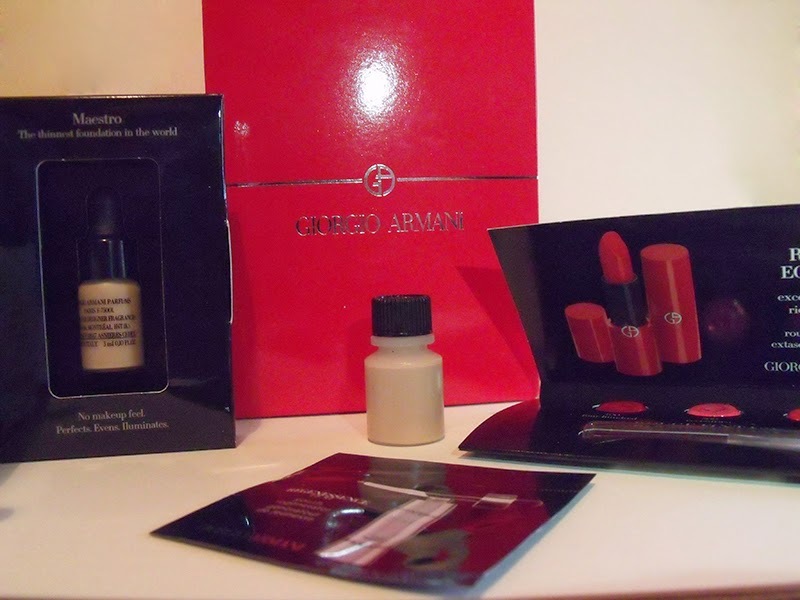 We were given a short demo on how to achieve a smokey eye look with a bold red lip using some of Armani's top selling products and must haves from their collection. We were greeted with Cava and chocolates on arrival and sat down at the area to watch the makeover and a talk through on prepping the skin ready for a flawless complexion and how to create an Armani look in a few simple steps and minutes. Did you know that keeping your makeup on for one night while sleeping ages your skin by 7 days? Using a good skincare routine and removing your makeup without makeup wipes and appropriate skincare products will help your skin breathe during sleep and help with signs of aging. These are some of the products that caught my eye while watching the makeover. These products were also used on the model. This is one of the fluids that were used on the models face, you can use them to warm up foundations, as blushers, to correct the tones and warm / cool your foundations. This fluid in particular was used as a blush. Eye shadow powder quads were also passed around, containing shimmers and mattes. These ones were similar to the ones used on the model. The shimmers were velvety smooth and the mattes had good blending power. This product surprised me, as it looked like a cream, applied smoothly like a cream but it was a shadow! They had absolutely gorgeous colours in this range, and this was one of my favourites. The picture doesn't do the colours and tones justice, I was in shock at how beautiful it was. If I didn't have a mindset of looking for more out of my comfort zone colours I'd have bought this in a heartbeat, but as it's spring time I need to look at more lighter and brighter colours for my makeup collection. We also had a look at two types of lipstick, one which was more like a balm and quite sheer, and one which had more of a colour. I like how they have different intensity lipsticks, I find this is something most brands lack in. This was the completed look, it turned out to be a day or night time look which looked amazing, with a beautiful radiant finish. We then looked around the counter at what Armani had to offer, it ranged from skincare for men and women, fluids to enhance your makeup, foundations, tints, eyeshadows, lipsticks, nail enamels, perfumes, blushes... everything a woman would need! I purchased two things, one which was a fluid that was used on the model as I lack more red blush colours, and this shade would be perfect for the summer, and an orange lipstick which I have been on the hunt for for a while but haven't found the right colour, this one was perfect and from their more sheer line of lipstick, so it's perfect to wear as a subtle colour or with a few layers for a bright colour. I also came away with a goodie bag and was told that there was a full size mascara inside but when I arrived home there wasn't a mascara inside, which I was pretty disappointed at and would have loved to review and try out, but there was a Maestro foundation inside, a primer sample, 3 lipstick samples and a serum, so I did get a few things to try. I have tried the primer on and it has a lovely glow and evens the tone of my skin perfectly! I had a great night at the event! The staff were friendly and interacted with us girls and were happy enough to let us try different products out. Do pop in to the counter and talk to the staff if you'd like to try out any of the products listed!